Navy Seaman Tony Dougal, an intelligence specialist, surveys the water Aug. 11 during search and rescue operations for a missing U.S. Marine in the Surigao Strait. The U.S. military has concluded an unsuccessful five-day search for a Marine who is believed to have gone overboard from an amphibious assault ship off the coast of the Philippines, U.S. officials said Tuesday. The Marine was a member of the 13th Marine Expeditionary Unit, a force deployed aboard the USS Essex and two other ships. The Marine was reported missing Aug. 9 at 9:40 a.m. while the ship was crossing the Sulu Sea west of the Philippines. That prompted a round-the-clock scramble in which 13,000 nautical square miles of the Sulu Sea, the Mindanao Sea and the Surigao Strait were searched, with U.S. aircraft performing more than 110 flights, the Marine Corps said in a statement. [post_ads]The Marines received additional help from the U.S. Embassy in the Philippines, U.S. Coast Guard and government of Singapore, Marine officials said. 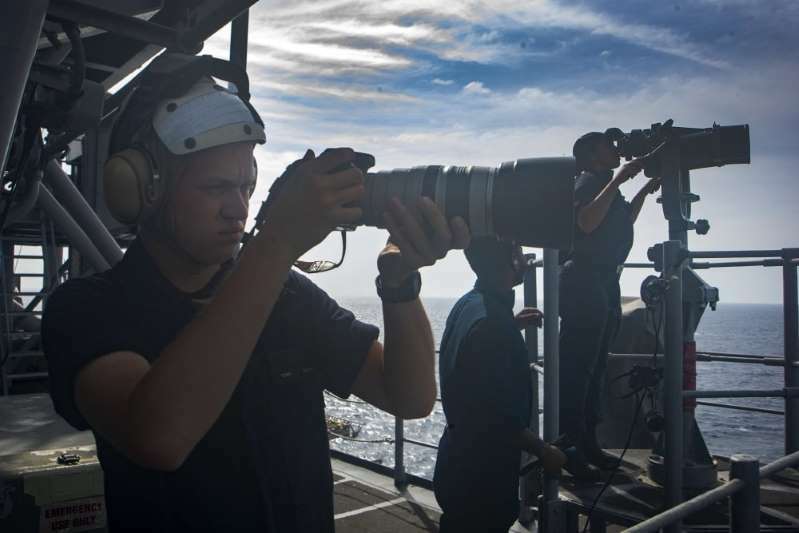 U.S. personnel searched using high-powered binoculars aboard ships and from helicopters and P-8 reconnaissance planes overhead. The commander of the Marine’s unit, Col. Chandler Nelms, said in the statement that the Marines demonstrated “tremendous resilience and put forth an extraordinary effort over the past five days.” He was humbled, he said, by the teamwork and professionalism of the Marines and sailors involved in the search. The missing Marine’s family has been notified of his disappearance, but he or she has not been named. The incident is under investigation, U.S. officials said. The units involved departed from their home port in San Diego in July and deployed on the Essex and two other amphibious ships, the USS Anchorage and USS Rushmore. The search began in the Sulu Sea and eventually was widened.